Rail Coach Factory Recruitment 2018 for 195 apprentice posts declared on 17th Feb 2018 by RCF Kapurthala recruitment board . The vacancies count is 195. 19th March 2018 is the last date of application form. Check the officials details @rcf.indianrailways.gov.in. 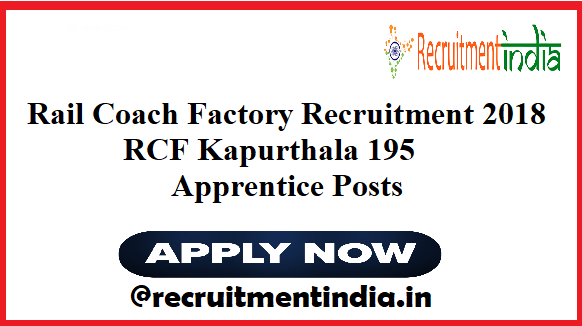 Check RCF Kapurthala Apprentice Recruitment 2018 : List out the most precious details of the rail coach factory latest jobs notification which is released in the official site of RCF. The reason why we have posted this article without the official announcement of the notification is we have got the employment news from the RCF recruitment officials related to the recruitment of 195 apprentice vacancies in the posts of the Rail coach factories presented in India. In any rail coach factory the recruitment might take place . So to intimate you about it in advance leading you to begin their preparation for these vacancies. 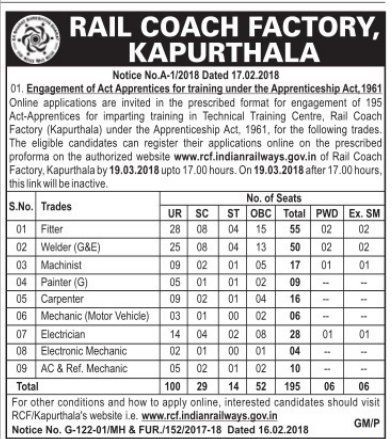 RCF Kapurthala Apprentice Posts Application Form : Actually in India there are various rail coach factories .Among all of them ,this Rail Coach factory located in Kapurthala is the prominent one with a huge number of employees. So many people will concentrate on this rail coach factory vacancies . The recent recruitment of rail coach factory is not confined to a single region .Hoping that it would considered all the vacancies present in all the rail coach factories and will prepare a perfect notification of listing out the details of all these RCF posts . Then it released the official notification regarding the 195 Apprentice vacant posts and initiate about the application process ,dates are 17th Feb 2018 to 19th March 2018 etc. Recruitmentindia.in alert you initial to the official announcement of the notification. The complete qualifications for Rail Coach Factory Recruitment 2018 notification as per the job wise. Willing candidates for this recruitment should have passed 10th class examination or its equivalent (under 10+2 examination system) with at least 50% marks, in aggregate, from recognized Board and also possess National Trade Certificate(ITI) in the notified trade issued by the National Council for Vocational Training. Candidates, age must be as per the Rail Coach Factory Recruitment 2018 that is maximum age is 24 years. Selected candidates for the posts will get the pay scale as per the rules of Rail Coach factory . At rcf.indianrailways.gov.in Get official notification of RCF Apprentice Jobs. That site is the only way to check the major notifications that are going in the rail coach factory. Through the notification only the waiting candidates for this recruitment will get their required data like job postings, number of job vacancies , needed educational criteria , on which dates the application submission is valid ,monthly salary package , application amount etc. Now the confirmed notification of this recruitment is not released but very few days you will see the display of the notification in the main RCF site. The Rail Coach Factory Recruitment 2018 for 195 apprentice vacancies will be out at any moment . So frequently visit our site to check the first update of this recruitment. In this site you can see the exclusive update of the RCF jobs. According the information sources the vacant posts names are Fitter, Welder (G&E), Machinist, Painter (G), Carpenter, Mechanic (Motor Vehicle), Electrician, Electronic Mechanic and AC& Ref. Mechanic. You can also check more Latest Railway jobs here in this jobs page. ITI welder pass 2018 ?